As the week progressed the thermometer kept dropping until by December 11th it was only 10 degrees. Weather notwithstanding, Bessie’s social life was full of dinners, luncheons, teas, and visits to the theater. Estelle was busy knitting hats and socks for the soldiers in World War I and rolling surgical dressings for the field hospitals. Marjorie and George were living in Columbia, South Carolina, where they, too, suffered from the cold. 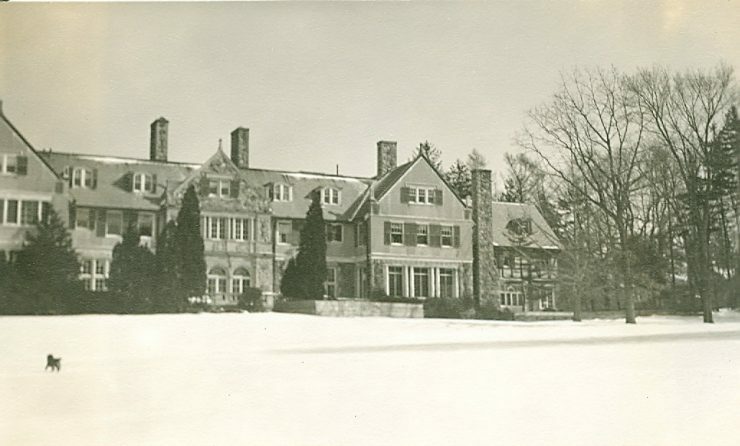 Marjorie wrote that she slept in “stockings, tights, a sweater, four blankets, a spread and a fur coat!” They arrived in Boston on December 22nd to spend the holidays with the family: the house on Commonwealth Avenue was beautifully decorated with Christmas greens from Blithewold. The following day everyone decamped to Bristol. It was 18 degrees at Blithewold, but Estelle described a “perfect day, very clear, and colors in the sky and on the water very lovely.” On Christmas Day gifts were exchanged and Estelle’s favorite gift came from Bessie — the bronze ship’s clock that is still by the bed in Estelle’s bedroom. Dinner was an especially pleasant time, with Bristol family and friends, and Augustine went skating. On New Year’s Eve the thermometer at Blithewold registered 12 degrees below zero and the English walnut and big linden trees split from the cold.